Visual voicemail is an improvement over voicemail in that it allows you to browse through your messages and listen to any one at will, with a lot of other options, rather than having to sequentially to each one of them passively. It consumes time and hammers on your nerves at time to have to lag behind with technology, or lack thereof. More so if you have a business and need to get things sorted out quickly, and you don’t want to miss out on a customer whose calls may be the last in a row of ten missed calls. Now you have a phone (smartphone rather) and want to know whether you can have or already have visual voicemail on it. You might be having an app or a service that you are not using. So check it out. Visual voicemail functionality is implemented in software, that is it does not depend on which components your phone is built with, like Wi-Fi or a camera. It will however depend on the operating system your phone is running. In this sense, it will depend on the phone model you are using. For instance, you will have embedded visual voicemail functionality in the latest versions (4 and 5) of the iPhone. 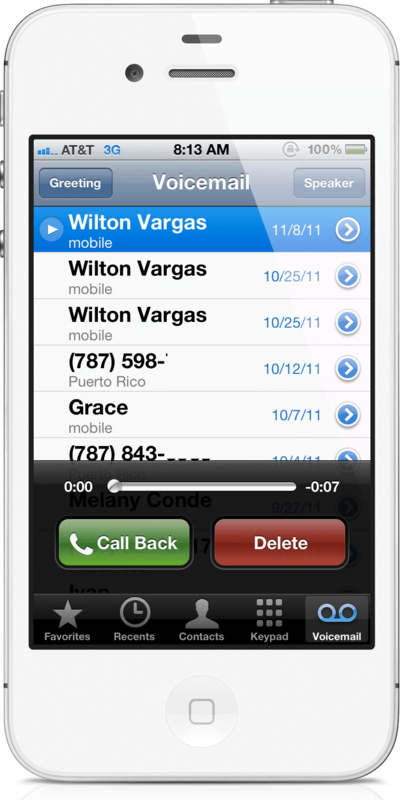 The iPhone 3 has been criticized for lacking visual voicemail, and the next version didn’t fail to implement it. If you own an iPhone 4 and have never been using visual voicemail (many people aren’t aware that they can), there are certain settings you need to tweak to get it going. You need to create a password and a greeting. Look for the voicemail icon and tap on it. Android so far has no embedded visual voicemail functionality but has a lot of third-party app that can allow you to use it on your device. The new version 4.0 offers an enhanced visual voicemail API for developers. Windows Phone 7.5 embedded in the OS. Visual voicemail also comes with the service, the mobile service of VoIP service. They host the messages on their servers and offer you a web interface for management and manipulation, or give you a visual voicemail app to download and use with their service. AT&T. You get visual voicemail with AT&T on registering for an iPhone data plan with a new iPhone, or with a 4G LTE plan for Android. You also have plans for Windows BlackBerry phones. The basic service is free, with a limit on the number of messages they can store, on the duration of the messages and on the number of days they are stored on their server. You have usage charges for uses above the basic, like using visual voicemail while roaming, exceeding domestic data plan etc. Verizon. For a montly fee, you get the visual voicemail service for your Verizon phone and an app you can download and install for management of the mails. Obviously, not all devices are supported, so check this list to make sure yours is. T-Mobile. Visual voicemail with T-Mobile is a free service, and comes with a free app. The downloadable app comes only for Android on Google Play. You get the service with any new device bought from them, or on the data plan registered for. So, when you consider using visual voicemail, or when you include it as an important feature in your next phone to buy, pay particular attention to the model, the OS it is running and the service you will be running. Your mobile operator needs to support visual voicemail for you to be able to use the feature on your phone. If you don’t have visual voicemail included in your phone, or if you want to use something with added features, you can try some of the third-party applications and services.